The Liverpool Pembroke Sefton club headed for Mansfield for the traditional high quality cross country relays that always attract large fields. 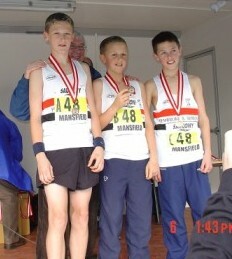 At Under 13 the squad of Jake Helm, Mike McCarten and Chris Hesketh astonished everybody with third spot. Only the might of the Sale and Aldershot clubs prevailed. Mike even surged into the lead on leg 2. The trio are all West Lancashire. Jake and Chris are from Tarleton High School and Mike from Up Holland.The Under 15`s performed well with Sam Hutchinson, Andrew Bowen and Kieron Sloan 15th and the Junior team 12th through Ben Jones, Michael Rimmer and Rob Stocks. The club also finished teams at Under 17(Chris Melling, Joe McKenna and Sam Glynn) and the senior squad of Steve Donegan, Colin Jones, Ian Crichton and Cal Williams were among the pack but relished their first outing in these relays. The autumn sees the ranking lists published and LPS had no fewer than four athletes significantly placed. Michael Rimmer was only marginally second in the Junior Men`s list at 800m and his incredible season has earned him a place in the Great Britain team that will head for Bendigo, Australia in the next few weeks for the World Youth Games. Phil Taylor was 19th in the 400m outdoors but second indoors after taking the national title. Ben Jones is always just a whisker away from a major achievement and was ranked 6th at 5000m. Throws coach at the Edge Hill College track, Merrik Bousfield, will also be smiling as his protégé, Natalie Walsh, got among the best in the Under 17 Discus in 13th spot. Liverpool Pembroke Sefton, once a dominant force in local Senior Men’s cross country running, have suffered a few lean years. Now there are signs of a resurgence. A blend of youngsters and seasoned veterans is beginning to indicate a new renaissance for the local club . After the first Liverpool and District League match LPS was a comfortable third but the second encounter, on the difficult Beacon course, was a revelation. Star Jimmy Boardman, just a week after representing the North of England in his first international match in Belgium and finishing a creditable 42nd, ran comfortably for fourth spot. The real shock was Adam Clansey putting together one of his finest runs and coming home sixth. Colin Jones was equally inspired jumping six places from the previous match to 12th together with the young Steve Donegan, although misjudging the finish, also making a giant stride to 24th. Two of LPS`s amazing veterans stepped forward in the shape of Jeff Mason(26) and Graham Cairns(33) to close in and the club was second to Liverpool Harriers. Newcomer, Clive Parry, nearly joined the party in 47th place. Kevin Carroll(58) and Mark Leicester(68) also had useful runs. Given that the squad still has some very useful runners not quite ready to step up yet LPS can begin to relish a return to medal-garnering days.